Star Princess offers passengers a cruise experience, filled with entertainment options and activities. Enjoy pure luxury along with fantastic ocean views with 711 staterooms offering private balconies, in addition to a full deck of Mini-Suites. Soak up the sun at one of four swimming pools, enjoy a stroll along the wrap-around Promenade deck or re-charge at the Japanese-themed spa complete with gym and fantastic ocean views. Guests can enjoy numerous dining options on board the Star Princess, such as anytime dining at the Portofino and Capri Dining Rooms as well as a more formal style of traditional dining with set meal-times. Star Princess also offers a number of specialty dining options such as Sabatini’s Italian and the Crown Grill. Passengers are sure to find a dining option which fits their individual needs. However, life on board doesn’t end at dinner time, there are numerous evening entertainment options such as live performances at the Vista show lounge, outdoor movie screenings, a casino as well as a nightclub and numerous lounges to keep passengers entertained into the early hours. 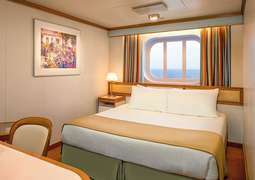 A cruise with the Star Princess means the choice of 1297 luxury cabins. The friendly design in each one spans over at least 15m², thus allowing you plenty of room to stretch out and relax. 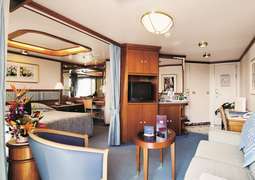 The Suites on board the Star Princess offer one-of-a-kind luxury in spacious rooms. No matter which cabin you choose, your cruise holiday is guaranteed to be a wonderfully unforgettable experience. A great selection of cuisine is offered in many different restaurants on board the Star Princess, ensuring satisfaction for every taste. 'Sabatini’s', an Italian restaurant, and 'Crown Grill' are particularly popular. You even have the opportunity to dine in some of the specialty restaurants around the clock. The professional chefs on board the Star Princess design their menus with new creative dishes every day. 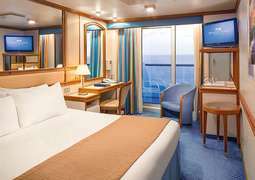 In case you’d like to linger a little longer by the pool, you can also find plenty of snacks and smaller meal options in one of the casual dining restaurants or right on deck. The Star Princess offers her guests a wonderfully diverse entertainment programme in many great locations, including an open-air cinema 'Movies Under the Stars', a 'Princess Theatre', a casino and a nightclub among many others. The theatre is renowned for its excellent acoustics and the cinema is home to all the best first-runs. Cosy evenings can be spent enjoying a delicious cocktail at one of the numerous onboard bars. Other offerings include art collections, interesting lectures and courses with expert instruction. The sports and wellness options on board the Star Princess are also extensive. Balance out the culinary work of the master chefs with a run on the athletic track, with a visit to the well-equipped fitness centre or with a game of football or tennis. Multiple heated whirlpools are naturally also available to help you send the stress of your everyday routine on its way. The dress code is casual during the day; feel free to dress at your leisure. Smart-casual clothing is recommended for evenings, and fancier, more elegant clothing is welcome for special occasions. Warm clothing should also not be forgotten for air conditioned spaces and cool evenings on deck. The Star Princess, sister ship of the Grand and Golden Princesses, has something on board for every member of your family. It incorporates a mix of traditional and contemporary cruising features. Since her renovation, she has many exciting new features, one of which is the Piazza, which features daily entertainment, and boasts new establishments such and a wine bar, sushi bar, bakery and an internet café. She also has more extensive shops than ever before and of course the beautiful adults-only area ‘The Sanctuary’ where the grown-ups on board can relax completely. There is also Movies under the Stars, a quintessential feature on board Princess Cruises. Dining is also a particular highlight on board the Star Princess. Enjoyable dining on board the Star Princess, from your own balcony to the Lido deck! 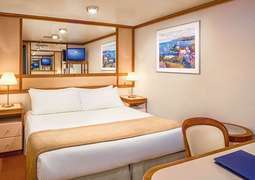 Many cabins on board have balconies, offering you the opportunity to relax in your own private space and watch the beautiful ocean scenery pass you by. This can also be a great location to enjoy the views into and out of ports, as well as the breathtaking vistas of Alaska, and the stunning islands of Hawaii. On your own balcony you could also enjoy Ultimate Balcony Dining, where you will be treated to pre-dinner cocktails, a multicourse lobster or steak dinner as well as a souvenir photo. This is sure to be a memorable and very special night on board the Star Princess. Room service is also available 24 hours a day. There are many other dinner options on board. The Capri, Portofino and Amalfi are the main dining rooms, where everyone is sure to find something to suit their culinary taste. There is also the round the clock Horizon Court buffet, that will fill your tummy night and day. There is also a plethora of other dining options on board. Fantastic Northern Italian cuisine can be found at Sabatini’s, and at the Crown Grill, you can satisfy a craving for steak or seafood. On the Lido Deck, casual snacks are the order of the day. Hot dogs, French fries, pizzas, hamburgers and ice cream can all be enjoyed here. New additions include the International Café, where you can find a delicious breakfast, pastries, soup, quiche, sandwiches, salads, sweets and coffee. At Vines, a delicious range of tapas as well as an extensive wine list are available to you. After dining, things really heat up with lots of places to kick up your heels. In the Explorer’s Lounge, the 70’s themed dance night is always popular, as well as the traditional dance evenings. The Skywalkers lounge kicks off later in the night and is the place to go to disco! Dream worthy destinations on board the Star Princess! The beautiful Star Princess cruises North and South Americas, taking you to stunning cruise locations such as Hawaii and Alaska, as well as various locations on the West Coast of America. In Hawaii you could visit the capital, Honolulu, or other beautiful spots such as Hilo, Lahaina and Nawiliwili. In Alaska there is Skagway, Juneau, Tracy Arm Fjord and Ketchikan which are all sure to wow and delight you with their stunning landscapes and breathtaking beauty. Along the west coast, the cities of Seattle, Vancouver, Los Angeles and San Francisco are all stop overs for cruises with the Star Princess. Your time both on board and on land is sure to be amazing and memorable with the Star Princess. Sail through some of North Americas best highlights onboard the Star Princess from Princess Cruises. Call our experts today for more details – 1300 887 590.